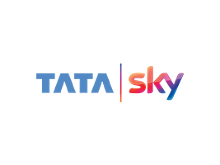 Save with the latest Tata Sky promo code for India - Verified Now! Choose a Tata Sky coupon from our list as per your need and copy the Tata Sky coupon code and paste it on the retailer's promo code section. Once, you will enter the code, you will see the reduction on the total amount. In case of using a deal, just click on the chosen deal and you will be redirected to the retailer's page. Get your Tata Sky UHD 4K set top box today and enjoy its competence of delivering 4K ultra high definition picture quality and Dolby Digital Plus 7.1 surround sound. Experience 4 times high resolution picture, true colour. To watch full HD channels, the subscriber need to pay Rs.175 per month for the access. So, subscribe your Tata Sky UHD 4K box today and watch 4K transmission channels. Don’t want to miss a single episode of your favourite show? Don’t worry, download the app and watch TV on your mobile wherever you go. Enjoy live streaming of above 240 channels without any interruption, just download Tata Sky TV today. You can submit your queries by filling up contact us form providing subscription ID, nature of request and comment. In other case, you can also call at its toll free no. 1800 208 6633 or call at 074117 74117 for new bookings. Yes, Tata Sky brings its new Tata Sky + HD set top box for those people who don’t get time to follow their favorite show every day. It allows user to record up to 3 shows or programs at once. Buy this set top box today by spending just Rs.9300 and record your much loved shows to watch later. Get it now! Watch your favourite shows and movies without any interruption with Tata Sky while spending less. We are here to help you with the best Tata Sky promo code and Tata Sky voucher. You will find a wide list of best Tata Sky coupon code at our website using which you can grab Rs.1000 discount on total amount. Moreover, subscribe to new channels using our Tata Sky coupon and enjoy instant Rs.700 discount on your total. For more amazing discounts, browse through our website and subscribe today! Tata Sky users can now choose channels as per their choice as they came up with their new TruChoice channel packages. One can choose their package according to genre based on DTH packages like regional packs, base packs, add-on packs, Tata sky service packs and more. You can also buy HD channels & services packs, long duration packs and multiTV subscription for your home at an affordable price. To save a little more, you can also choose our Tata Sky coupons for up to Rs.1000 discount. To make your life more interesting, Tata Sky brings a special service for you all users. Subscribe to your preferred channel as they have services like devotion, cooking, acting adda, Bengali entertainment add free, Bollywood premiere, classic cinema, classroom, comedy and much more. Subscribe to the service you want and enjoy it 24/7 without any interval. You can also check out our latest Tata Sky coupon code for up to Rs.700 discount on subscription of a new channel. To watch live TV on the go, you have to download the app from Google, Apple store or Tata Sky website now. Simply, log in to your subscriber ID/RMN and enter a unique name to register your mobile device. You can register max. 2 devices using the same user ID and it if free to use. So, don’t wait, register your account today to watch unlimited live TV shows, movies and more. Tata Sky presents impeccable feature set top box with amazing picture quality and sound at affordable prices. You can choose from Make My Pack and ThruChoice package starting from Rs.1800. Existing Tata Sky users can now apply for multiTV connection as well for just Rs.1800 and pay the price of what you watch. You will get 1 year annual service commitment, relocation services, unmatched customer services and more. For additional discounts, you can also check out our Tata Sky coupon and grab massive discount on your total spend. Get a new Tata Sky connection now and do your recharge from any local deals or by calling at Tata Sky helpline no. 074117 74117. You can also do online recharge by visiting Tata Sky mobile website and using any bank credit/debit card.